Jainnie Jenkins: Frustration, Fluster-Busters and Little Successes! Frustration, Fluster-Busters and Little Successes! But I mean, that's fine. I know about frustration, and I actually embrace it these days. It's part of the creative process. You have to experience frustration at some point in order to have a breakthrough, you just HAVE TO. But everyone deals with it differently. Do something else to give my mind a break. Go for a walk, do some yardwork, etc. Eat. This has its own number because eating really is not giving your mind a break. It just causes a whole set of problems: what do I want to eat? leftovers? cook something? hey, didn't the Pioneer Woman have a recipe for a yummy chocolate something or other?? I actually ended up going to sleep. I guess that should've been #4. 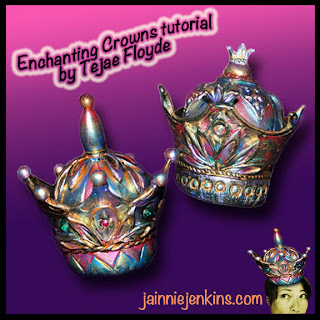 Today was a better day, as I finished the 2nd crown from Tejae's tutorial. That was my first little success. Like I mentioned before, following a tutorial or project can be helpful when you're stuck in a rut. It actually gives my mind a break, temporarily (until lots of ideas and versions come flooding in). Haha, Cuz! That is soooo kawai! Love the new header also. Mrs Queen of clay. These are gorgeous. I love the colors you chose. The corner photo is too cute. Keep making they are lovely. :).